Tangerine is a citrus fruit closely related to the mandarin orange. It’s smaller than common orange, usually easier to peel and divide. Most varieties are thought to have a more intense flavor than an orange – sweeter, sometimes soursweet. Tangerines are a good source of vitamin C, beta-carotene and folate. Tangerines do well in warm, humid, tropical and sub-tropical regions. They do even better in areas with warmer nights, higher soil temperature and good humidity. Originating in the region of Southeast Asia, it was seriously cultivated in China. It then made its way through the trade routes, throughout the Mediterranean. The name “tangerine” historically alludes to the port of Tangiers, possibly the source of tangerines being shipped throughout the western world. Tangerine stock in Hawaii were brought by Chinese gardeners and farmers who migrated to the Hawaiian Islands. 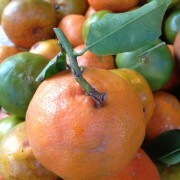 Tangerines are found in many Hawaii backyards. Tangerine season peaks November through January. – It is always a good idea to wash whatever you eat. Even if it has its own wonderful peel like a tangerine. – Tangerines are wonderful just as is, peeled and popped into your mouth. – Tangerines are sometimes added to salads and desserts. – Someone gave you a whole bag from their overfruiting tree? Juice the fruits you can’t eat and freeze the juice in ice trays, then bag your tangerine cubes to enjoy when the season is over. Look for unblemished fruit that have heavy feel. A sweet tangerine also smells sweet. Select ripe fruits, as citrus, unlike other fruits, do not ripe after picked and as the days go on they will rot. Tangerines, being the most fragile of citrus, needs to be enjoyed rather quickly. Store at room temperature, be careful not to let sit on counter in plastic bags as they will grow moldy. Refrigerated, tangerines can keep their flavor and juice up to a week, but enjoy sooner than later.